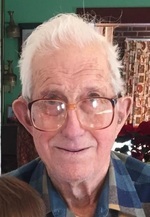 Harold G. Boyd, 95, of Ashland, passed away Sunday, August 26, 2018 at Brethren Care Village. Harold was born January 13, 1923 in Richland County, Ohio and was the son of Glenn and Lillian (Keith) Boyd. He was a lifelong farmer and had farmed the land he owned on Co. Rd. 601 since 1961. He was an active member of the Nankin Community Church and helped on many church mission trips. cared about the land and would help anyone. On September 13, 1947, he married Evelyn E. Owen in Streetsboro, Ohio, the couple had been married for over 70 years and she survives him. He is also survived by one daughter, Kathleen (Gary Lee) Hahn of Crossville, TN; two grandchildren, Michelle (Jonathan) Peer and Donivan (Christan Simms) Hahn: two great grandchildren, Bennett William Peer and Adelyn Eileen Peer; and one sister Betty Lawyer of Mt. Gilead, OH. He was preceded in death by his parents, one sister, Ruth Lillian Fetzer and two brothers, Robert and Clyde Boyd. Funeral services will be held Saturday September 1, 2018 at 11:00 a.m. at the Nankin Community Church with Pastor Jake Heskett officiating. Burial will be in the Ashland County Memorial Park. Friends may visit with the family on Friday, August 31, 2018 from 5:00 p.m. to 7:00 p.m. at the Denbow-Gasche Funeral Home. Memorial contributions may be made to the Nankin Community Church, 795 St. Rt. 302 Ashland, Ohio 44805 or to Pathways Hospice, 1171 E. main St. Ashland, Ohio 44805. To send flowers to the family of Harold G. Boyd, please visit our Heartfelt Sympathies Store.